The most popular in the STS family, the 3520 packs tremendous performance and flexibility into a very compact package. It tests more devices per square foot of factory area than any competitive system, making it a particular favorite for cost-sensitive products. Yet, it offers the same high precision as systems costing many times more. No parameter is more important to the semiconductor manufacturer than throughput. The STS 3520 provides higher throughput than any other system in its class by combining high-speed instrumentation with a powerful UNIX-based Linux Operating System running on a fast Intel CPU. In addition, high-speed processors are incorporated into the system’s instruments to handle all time-critical functions, freeing the CPU for other tasks. The STS 3520 offers the smallest footprint of any comparable test system. It achieves this not only with its small cabinet size, but also with its built-in tabletop and extremely compact test head. For profitable manufacture of low-cost, high-volume ICs, it provides the highest productivity per square foot in the industry today. The STS 3520 slashes the time needed to get new devices to market by addressing the test engineer’s two most time-consuming tasks: fixture-development and program debugging. 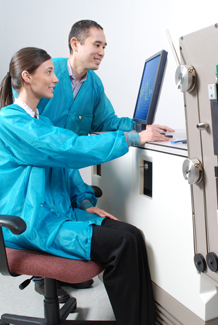 To speed the process of developing new test fixtures, the STS 3520 incorporates a unique Programmable Test Head (PTH). The PTH is configured with plug-in modules, which provide all of the functions normally needed for mixed-signal testing. This dramatically reduces fixture complexity and the time needed for design, assembly, and debugging. Program debugging time is also greatly reduced by the windowing and graphical capabilities of the Linux Operating System. Analog Wavetool™ and Digital Wavetool™, ATS’s newest graphical tools, set a new performance standard for the creation, manipulation, and graphical display of complex analog waveforms and digital patterns. The STS 3520 employs a Layered Focus Architecture to bring the benefits of enhanced accuracy and flexibility to every application. Three distinct hardware layers (mainframe, PTH, and fixture) allow circuitry to be optimally located for high accuracy and noise immunity. Many PTH modules, for example, serve as “front ends” for mainframe instruments, providing signal conditioning very close to the test socket. Each of these hardware layers can be further divided into two layers of focus: standard and custom. A large catalog of standard instruments and modules allows each system to be configured to specific customer requirements. But new requirements emerge constantly, and the custom layer is provided for quick response to these needs while new standard instruments are being designed. The STS 3520 gives you a testing advantage by getting new products to market quickly, then reducing test costs as volumes increase. Because the STS 3520 delivers the highest productivity per dollar and per square foot, it is truly the Smart Choice in mixed-signal test.